1. Give a brief description of your business. What product(s) or service do you provide, and what sets you apart from others? 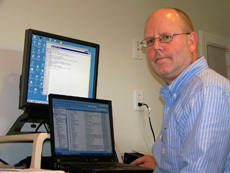 SOHO Systems provides IT services to small to midsize businesses, home office and home/family computer users. SOHO is a full service provider from computer repair to systems and network design and installations. We service our clients both onsite and remotely, offer system monitoring and alerting, preventative maintenance, application consulting, training, and along with our partners, we offer web design, cabling, voice and multi-media support. We speak plain English, not techno-babble and work to find solutions that fit our client’s budgets, needs and styles. We don’t expect our clients to conform to specific configurations or applications. Each client is different and we customize our approach to supporting them individually. 2. How long have you been in business, and how did you get involved in this business? I have been servicing my clients for over 10 years. 3. How many employees do you have? Currently SOHO Systems is just me, but again, through a network of partners we have the personnel and expertise to meet most IT consulting and service needs. I have been in the business of IT customer service for pretty much my entire adult life. I have worked for big computer companies and small. I’ve worked on large computers in large data centers at big companies and small computers at small companies and homes. My experience is broad and extensive. Also, people always ask about the name; SOHO is an industry acronym for Small Office Home Office. 5. What are some of the pitfalls one faces when owning one’s own business? 6. What is the best business advice you’ve received during your career? “Fix the Customer” In the computer services business there are many really good technicians and engineers but the best are able to go beyond fixing the machine. 7. Do you have a business mentor? If so, who is it? 8. How has your business been affected by the current economy? My core of clients have weathered the storm so far and they still rely on their computer systems to run their business which keeps me busy. I’ve seen a bit of a slowdown in new system installs but maintaining existing systems has been solid business. I’ve picked up some new business during this time as well. 9. Tell us an inspirational or humorous story about your business? This particular incident happened when I was working as a customer engineer at one of the big computer companies years ago. Maintenance and repairs of our clients’ computers were covered under their maintenance agreements except for situations of neglect or abuse etc. such as spilling liquids into your machine. I responded to a call for a bad keyboard and the user insisted he didn’t do anything to cause the keyboard to malfunction. When I lifted the keyboard off the desk, in a perfect outline of the keyboard was half of his morning coffee puddle on the desk. He had cleaned off the top of the keyboard and all around it but not underneath. 10. If you could go back in time, would you change anything? Finally, give the address of the business, and the contact information..
SOHO does great work. I have used them many times. Business is performed in a “personally professional” way. No BS, only results. Keep up the great work!! !